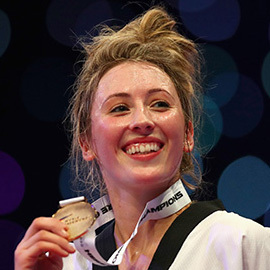 Athlete and Olympic speaker Jade Jones is best known for winning Great Britain’s first ever taekwondo gold medal at the 2012 Olympic Games in London. This stunning success came just two years after Jade had won her first gold medal, this time in the Youth Olympic Games in the 55kg category. In that same year she won a bronze medal at the European Taekwondo Championships in Russia (in the bantamweight category) and was voted BBC Wales’ Junior Sportswoman of the Year . Other medals in Jade’s collection include (in the featherweight category) a silver at the 2011 World Championships, a bronze at the 2012 European Championships (the same year the Olympic speaker became BBC Wales Sports Personality of the Year ) and a silver at the 2014 European Championships . In 2015, Jade Jones won another gold in the 57kg category, this time at the European Games in Baku. In the same year, she controversially lost out on a semi-final position in the World Taekwondo Championships in Russia, being beaten 10-9 in the quarter-final. Getting her MBE in 2013 for services to Taekwondo, Jade has become an extremely popular Olympic speaker, entertaining audiences with her tales from one of the most technically challenging sports the Olympic Games have to offer. To book leading Olympic speaker, Jade Jones MBE to make a personal appearance at your corporate event, function or conference, simply contact the Champions Olympic Speakers agency by filling in our online contact form. Alternatively, call a booking agent directly on +44 1509 85 29 27.